View More In Outdoor Fryer Accessories. Bayou Classic continues to be the industry leader in outdoor cooking equipment such as turkey fryers, stainless steel stockpots, cast iron cookware, and aluminum stockpots. The Bayou Classic 10 Quart Aluminum Fryer Pot with Basket (no lid) is the perfect addition to any indoor or outdoor cooking environment. The 10 quart pot is constructed of commercial strength aluminum and features heavy-duty riveted handles. The included basket has a cool-touch handle for ease of use. 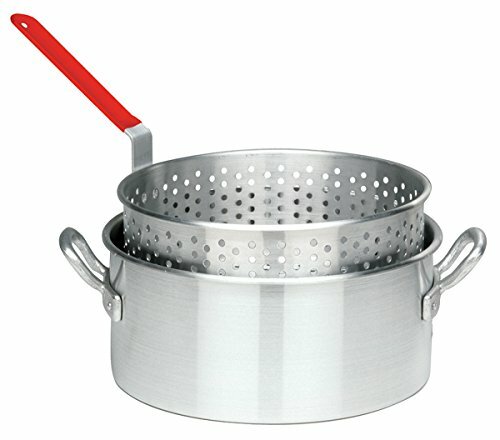 With the basket, this fry pot is the ideal size for deep frying French fries, hush puppies, fish, or chicken. Remove the basket and boil soups, stews, gumbo, jambalaya, and low country boils. You can use this inside on your stovetop or outside with your favorite Bayou Classic propane burner. Excellent for use when fishing, hunting, camping, scouting, tailgating, or in your own backyard. This Bayou Classic product is a must-have in your collection. Bayou Classic 126 Nickel Plated Wire Mesh Fry Basket, 12"